Background: Randomized clinical trials (RCTs) can provide a high level of evidence for medical decision making, but it is unclear if the results apply to patients treated outside such trials. Objective: The aim of this study was to retrospectively compare outcomes of patients with esophageal cancer treated within and outside an RCT. 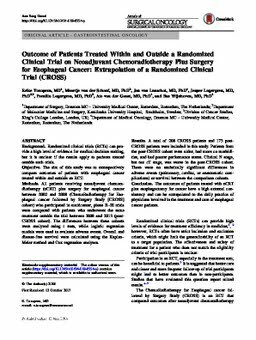 Methods: All patients receiving neoadjuvant chemoradiotherapy (nCRT) plus surgery for esophageal cancer between 2002 and 2008 (ChemoRadiotherapy for Esophageal cancer followed by Surgery Study [CROSS] cohort) who participated in multicenter, phase II–III trials were compared with patients who underwent the same treatment outside the trial between 2008 and 2013 (post-CROSS cohort). The differences between these cohorts were analyzed using t tests, while logistic regression models were used to evaluate adverse events. Overall and disease-free survival were calculated using the Kaplan–Meier method and Cox regression analyses. Results: A total of 208 CROSS patients and 173 post-CROSS patients were included in this study. Patients from the post-CROSS cohort were older, had more co morbidities, and had poorer performance status. Clinical N stage, but not cT stage, was worse in the post-CROSS cohort. There were no statistically significant differences in adverse events (pulmonary, cardiac, or anastomotic complications) or survival between the comparison cohorts. Conclusion: The outcomes of patients treated with nCRT plus esophagectomy for cancer have a high external consistency and can be extrapolated to the daily practice of physicians involved in the treatment and care of esophageal cancer patients.